There are an estimated 1,150,000 back surgeries done in this country every year (this number has been rapidly growing) and it has been estimated that only 5% of people with back pain actually need surgery. Of those who have back surgery, 8% with have a second operation within 1 year, and 20% will have a second operation within 10 years. That’s 28% having a second surgery in the next decade. Spinal fusion surgeries have increased 8 fold in the last 15 years. 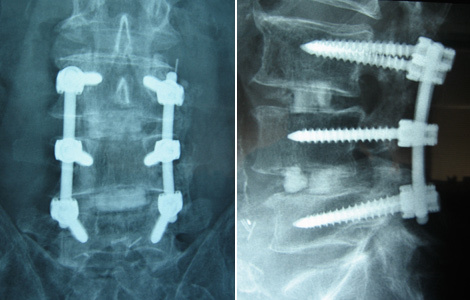 Spinal fusion is when the surgeon uses metal screws and bolts to permanently fuse two or more spinal bones together. These fusion surgeries are unsuccessful up to 50% of the time. Ohio Workers Compensation studied 1,450 with severe back pain. There was a study conducted by the Ohio Bureau of Workers Compensation that looked at 1450 people who were considered surgical candidates. Meaning they had significant back pain and in most cases had sciatica. In this study, half had a fusion operation and the other have did not have the operation. They followed each of these groups for the next 2 years, and they found that only 26% of those who HAD surgery were back at work, whereas 67% of those who DID NOT have surgery were back at work. They also found that there was a 41% increase in painkiller use (specifically opiates like morphine and Vicodin) among those who DID have surgery. Conclusion….. If you injure your back and want to return to work, do NOT have surgery! THESE STATS DO NOT SHINE A FAVORABLE LIGHT ON BACK SURGERY! Epidural steroid injection are popular these days, there were over 9 million of these shots administered last year for back pain. Research shows that injections provide relief to 50-60% of people, and this relief is usually temporary. Also worth noting is that these injections tend to lose effectiveness with each subsequent injection. Two side effects that have been linked these steroid/cortisone injections are spinal fractures and infection. With each injection there is a 29% increase risk of spinal fractures. In 2012 there was a large outbreak of fungal meningitis infection those who had received spinal injections. It was stated in the Journal of Surgical Neurology International that “The risk far outweigh the benefits of epidural spinal injections”. This is where true conservative therapy fits in. I say “true” because some people will consider injections to be “conservative”. But if you’ve read this blog and done your homework, you know that may not be the case. Examples of conservative could are. When considering that a spinal fusion surgery will cost you $75,000, these options are also conservative on your wallet. There have been numerous studies showing the effectiveness of conservative care on managing back pain. Chiropractic is the most popular and effective conservative treatment in the United States for back pain. There were 270 million visits to chiropractors last year and 83% of people feel “satisfied” or “very satisfied” with their care/results. There are times when surgery is necessary, and if it is truly necessary then the chances of a successful outcome go up tremendously! The key is determining IF it is necessary, and the above list of conservative care options is a good place to start. If you use conservative care listed above and are not getting better in 3-6 months, surgery might be a good option. The problem is that most people do not give these less invasive options a chance to work. More often than not, they DO work.